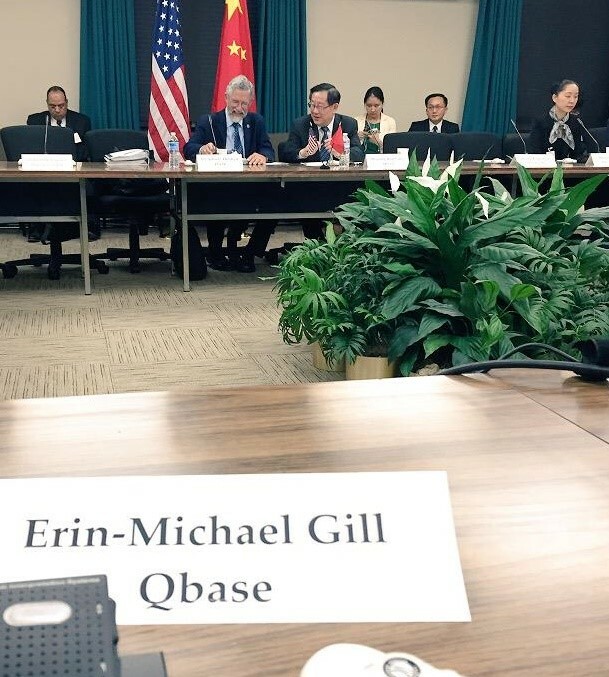 The final outcomes aren't public yet, but I thought this would be okay to share - I was invited by the White House to speak to the leaders of the United States and China’s innovation policies at the “6th US-China Innovation Dialogue” held at the US State Department on June 22. The meeting was co-chaired by China’s Ministry of Science and Technology head Minister Wan Gang, and The White House Office and Science and Technology Director Dr. John Holdren (both pictured having a quiet moment before the sessions began). I advocated for stronger IP rights as a way to reduce outside investor risk and enable a more diverse, innovation centric, economic base. I won't characterize the discussions other than to say that it was an impressive group of senior representatives from both the US and China, and in a very real way, the right people were brought together. Beijing sent leaders from China's Ministry of Finance, the State Intellectual Property Office, the National Development and Reform Commission, and the Ministry of Industry and Information Technology, as well as the Ministry of Science and Technology, while the US had representatives from the White House Office of Science and Technology Policy, U.S. Treasury Department, U.S. Department of State, Office of the U.S. Trade Representative, U.S. Department of Commerce, and the U.S. Patent and Trademark Office. Minister Wan and Director Holdren's leadership of the proceedings truly fostered a collaborative and constructive dialogue. Also noteworthy was Deputy Chief of Mission and Minister of the Chinese Embassy to the US, Wu Xi (pictured far right) who gave a beautiful and moving opening statement about how innovation and a culture of innovation can bring nations together. I'm looking forward to seeing the outcomes of this meeting, and hope it can be a catalyst for more positive collaborations in the future. All centennial celebrations have ended in Indy. The Indianapolis 500 race will take place on May 28, but the field will be officially established this weekend, with qualifying on Saturday and Sunday. Saturday's qualifying rounds will determine the Fast 9, and the nine drivers will eliminate him for the first nine positions on the field on Sunday after the No. 10 to No. 33 positions are determined. Both qualifying days can be viewed on ABC or via Indy 500 Live streaming. The Charlotte Motor Speedway and the USO of NC have teamed up to invite military ID card holders to the Coca Cola 600 race on Sunday, May 28, 2017. The two famous boxers Mcgregor vs Mayweather have given their consent to play a friendly boxing match on 26 in Las Vegas. The fight is considered to become the highest grossing event the history of any sport. The match was expected on Wednesday evening with a Mcgregor chirp up “The Fight is on”, moments at first Mayweather posted an uplift video on his Instagram page, towards with the caption “It’s Official”. In all likelihood the most profound approaches or tactics that parents can take in the sustainable dwelling is by means of reducing the quantity of electricity they consume from non-renewable resources. That basically means decreasing your intake of power produced by using resources like gasoline-powered generators in conjunction with other fossil fuels africangreenrevolution.com/sustainable-living-using-solar-heatings/. How could Yahoo's patents be worth $4b? Discussing Samsung IP Strategy On Bloomberg Asia TV's "First Up"